Can I get a recommendation on a QUALITY 5/8” Jacobs Chuck? I have a PC drill press (Lowe’s) and the chuck runs out noticeably. The spindle barely wobbles but once I install the chuck it is a whole different animal. Stay with Jacobs brand. pricey, but you’ll be happy with the results. Have you tried reseating your chuck in the arbor? If there is anything between the seating surface of chuck to arbor or arbor to spindle, that could cause your runout. The spindle shouldn’t wobble visibly at all. The Jacobs chucks are very pricey. Is the OEM chuck a 5/8”? The reason I ask is that I upsized my Delta from to 5/8” from the 1/2” OEM and found a substantial size difference between the 2 chucks. I also had to replace the arbor, since the larger one was a JT 4. Anyway, a very good chuck is the LFA, and it’s a lot cheaper than a Jacobs, and it’s made in France…not China (I was avoiding Asian chucks). They come in keyless versions as well. The photo below is the 2 chucks, you can guess which one is the 1/2”. Rohm is another quality brand, German. But if the arbor is wobbling, it might indicate a bearing problem, or could just be a bent arbor. Good chucks are expensive. Maybe you can find a used one on Ebay. A good Jacobs chuck can be rebuilt quite easily. The albrecht keyless chuck would be the best you could put on a drill press. Maybe you can find one used. What is the chuck you now have on your PC? 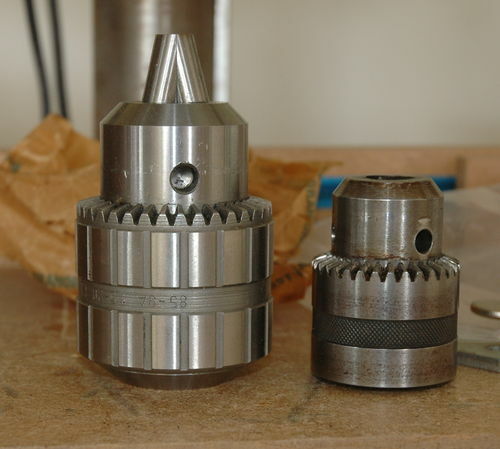 if it is a 1/2” chuck, the spindle probably has a Jacobs #3 taper. I don’t know if a 5/8 chuck is available with a #3 jacobs taper. My error. I meant arbor not spindle. This machine has a 5/8” chuck with a #3JT. Should be jt33 for the pc drill press. 14n is 0-1/2” I believe. 16n is 3/16-3/4” I believe as well and much larger. I had to get a different chuck recently as well. My 20” has an older 16n Jacobs. The only thing I have with a shank bigger than 1/2 were end mills. Had a PCB660DP myself before the 20”. Solid machine but the arbors and chucks are trash. You really shouldn’t use an end mill in this press. The chuck will pop off constantly. Is there a difference between jt33 and #3jt? Also: who sells an upgraded arbor? Jt33 and Jt3 are 2 different machine tapers, specifically Jacobs tapers. I’ve never had a bad arbor so I can’t help with that. Any decent brand should be good enough. Both ends of the arbor need to be specified, and my guess if the DP is MT2. That was a good suggestion to check MSC for info, but arbors can be bought in a lot of places, once you know which one you need search for it. I think one should match the chuck to the drill press. Good chucks get expensive very quickly and a Jacobs chuck could be around $200. I had a Jet floor model drill press and had a lot of run out. I was looking at new chucks. I rest the arbor several times with little improvement and found that I had quill slop. Unfortunately, most lower cost drill presses have no way to tighten the quill. Instead of a new chuck, I bought a new drill press with very low run out. I just now checked. The chuck on my machine is stamped JT3 and the owner’s manual specifies a MT2 arbor. So I have a 5/8” JT3 chuck with a MT2 arbor. Gotcha. Mine was jt33. Easy to look up Taper dimensions. It’s everywhere.